Most of us take walking for granted, but in the workplace walking while working are often associated with worker’s compensation and injury claims. According to one study, 55% of workplace falls are associated with the surface itself; 24% with footwear; 18% with improper training or no hazard warnings; and 3% with fraud. Clearly you need to pay attention to your workplace flooring. * While not usually fatal, slips and falls account for more lost work days than any other type of workplace accident. * Generally thought to be a common accident for the elderly, they are the leading cause for workplace injury in the workforce age bracket of 15-24. * They are the leading cause of worker’s compensation claims. * While fatal falls occur primarily in construction, mining and some specific maintenance activities, falls resulting in injury and compensation claims occur in virtually every industry. 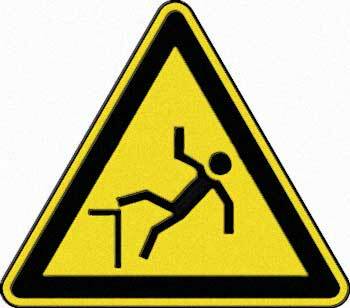 * The most common injury resulting from falls is fractures to bones. Fractures occur in approximately 5% of all falls. * 60% of all falls occur on the same elevation – they do not involve steps or heights. * Fatalities in the workplace resulting from falls are lower than in the past but falls still represent a significant hazard. * 85% of workplace compensation claims each year are attributed to falls due to slick floors. * Floors and flooring surfaces are directly responsible for over 2 million fall injuries annually. These facts serve as a reminder that every facility must pay attention to their workplace flooring and traffic. Why not do a walk through, specifically considering fall hazards? Are hazards and traffic patterns clearly marked and visible; or are they faded and worn? Are there trip hazards that everyone simply takes for granted? Do your deck and floor coatings provide a safe and non-slip surface; or is it time for them to be renewed? Taking time to evaluate today may save significant time and money in employee claims in the future.